The next adult visit to Bohars will be on Friday 2nd May to Monday 5th May 2014. This will be Bohars’ turn to celebrate our 30 years of twinning and they are planning to give us all a great time. It will be an ideal time for you to join the celebrations so if you’re interested in going then please get in touch for more details. Our annual quiz evening, open to everyone. Come along for a fun and not-too-challenging quiz evening organised by the Twinning Association. Teams of 6 to 8 people. Saturday 29th March 2014 in the Scout Hut at 7:00 for 7:30pm. Tickets are only £5.00 per person, available from members or from Swaffields. A limited number of tickets will also be available on the door. Don’t worry, no knowledge of French is needed for the quiz! 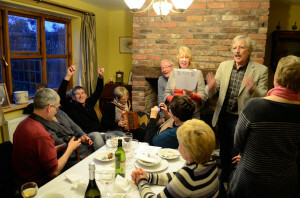 2013 was the 30th Anniversary of the Tarporley/Bohars twinning agreement, and to commemorate it in Bohars their Community Management Team donated a piece of land in the middle of the village to commemorate the anniversary. The land will be used for planting fruit trees and the crop will be for the whole village to pick and keep. The Bohars Twinning Group asked whether there could be a selection of pear trees from Tarporley planted in the orchard in honour of our joint venture. The Tarporley Parish Council was pleased to support the idea and kindly sponsored the cost of the trees. 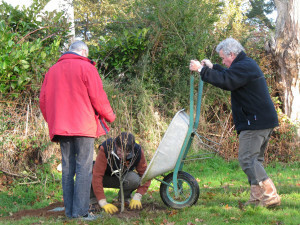 As November is regarded as the ideal planting time David Dunning, Chairman of the Tarporley Twinning Association, and long-time member Tom Kenny agreed to purchase the pear trees, take them across to France and plant them. A short trip starting on Friday 29th November for 2 nights took place and the trees were planted on Saturday morning – followed by a celebratory toast to the event! In May 2013 Tarporley hosted a 30th Anniversary visit by around 30 of our friends from Bohars. There was a reception with live music provided by the Tarporley silver band, trips to Llangollen and the Horseshoe Falls, as well as dinner and dancing at Willington Hall, and of course visits to Chester and local pubs. A commemorative plaque was presented and is now on show in the centre of Tarporley village.